Bottled in Bond and and 10 Years Old! Henry McKenna's credentials are well known as "Kentucky's finest table whiskey." But now, Heaven Hill Master Distillers Parker and Craig Beam have created Henry McKenna Single Barrel Kentucky Straight Bourbon Whiskey. Every bottle is filled entirely from a single barrel that has aged through 40 Kentucky seasons (10 years). This quality Bourbon is rich in tradition and heritage, and builds on the popularity of the Single Barrel and Small Batch Bourbons. 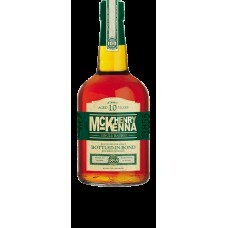 Henry McKenna Single Barrel is the only extra aged Bottled-in-Bond Single Barrel Bourbon, indicating it meets exacting U.S. government standards for age and proof. The label on each bottle of Henry McKenna Single Barrel contains handwritten authentication of the exact barrel number and the date it was barreled.